Updated 21 Dec: As promised, The Mole responds to Daim's non-fiction with columnist Salahuddin Hisham's Daim's Concern with Trust Deficit. Salahuddin basically urged all of us, especially those in Government, to take the former Finance Minister's words in good faith. He also asked Daim to furnish his "list" for the proposed economy squad that would "save" Malaysia. Way to go. I am sure all Malaysians are interested to see the list of experts that "both rakyat and investors can trust". TTDI, Dec 20: It took Tun Daim Zainuddin a long time - 15 months, to be exact - to agree somewhat with the DAP's MP for Kluang YB Liew Chin Tong who, on Sept 2 last year, wrote off PM Najib Razak's Special Economic Committee [Najib's special economic committee is a waste of time!]! But compared with the DAP man, our former Finance Minister's criticism was more constructive. Writing for The Edge, Daim said the PM should set up an economy management squad consisting of professionals with high technical skills, efficient and dare to speak the truth, and trusted by both rakyat and investors. Read Economist Team Failed, says Daim. He also ticked off projects like the Tugu, saying it was not what the rakyat need at this point of time. YB Johari Ghani, the Minister of Finance II, has responded to Daim in Hutang tak salah kalau boleh bayar but I'm interested to hear what the Special Economic Committee has to say to defend itself. The Mole's latest columnist Salahuddin Hisham (read his first piece Ringgit @ 5: Try again, Soros!) has expressed his intention to respond to Daim, too. Watch of for his article at mole.my tomorrow! p.s. In the meantime, shop as usual for Xmas because The ringgit will bounce back! tak salah kalau boleh bayar, yang salahnya nak bayar interest pun tak mampu, kena jual tanah. lepas jual tanah jual apa lagi? Belum masuk nak bayar principal lagi. "Daim said the PM should set up an economy management squad consisting of professionals with high technical skills, efficient and dare to speak the truth, and trusted by both rakyat and investors." 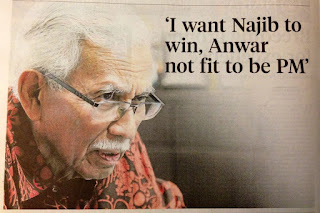 Let the faded old hookers like RPK spread their legs into the dedak sunset. Your talent can't be kept back. sometimes, early this year when the ringgit started to take a beating.... I remember you mentioned some analyst predicting ringgit will recover to circa rm3.80 by year end..
well lets see.. we have another 10 days to go before the ringgit hits rm3.80 per usd..
ASB dividen is 6.5% while ASN only 5%. WHAT SAY U, is Malaysian Economy still intact....????? he has track record of 8% GDP while he was our Finance Minister. The best thing is, pindahkan duit ke bank-bank asing.